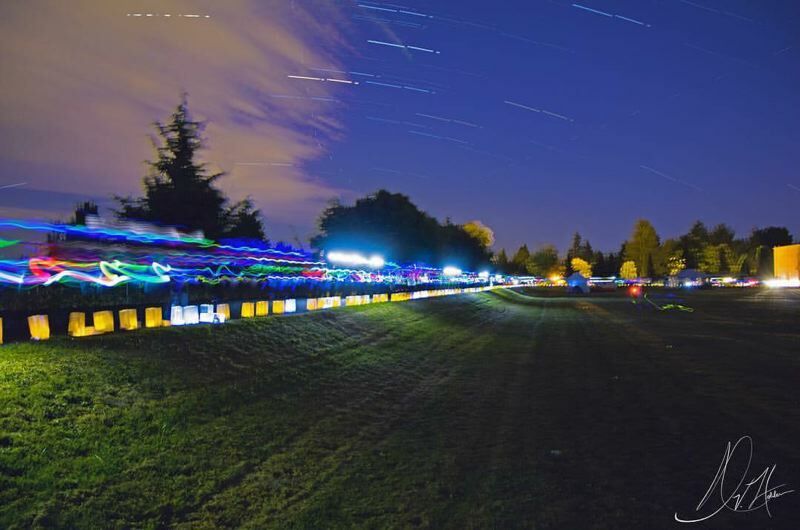 Tigard-Tualatin relay, and luminaria event, focus on what we have, not what we've lost. Every year, in the middle of July, our community gets together for the Tigard/Tualatin Relay for Life. If you've never been, our relay is a social fundraising event where team members take turns walking around a track for 24 hours to raise money for important cancer research, early detection screenings, transportation and lodging for cancer patients, and other vital patient services through the American Cancer Society. For many, it's a fun summertime event for a good cause, but for those of us involved in planning the event it is not just a 24-hour walk around the track, but an emotional culmination of a year-long effort to get the word out, bring people together, and honor the people in our lives who have been touched by this terrible disease. For the past six years, I have been in charge of the luminaria ceremony, which is what I think of as the emotional center of the event. It is where we all gather together to remember the people we've lost, support those who are fighting, and celebrate those who have won their fight. Even if only for now. As the sun goes down on the day's events, we begin to line the track with hundreds of luminaria bags decorated by families and friends in our community who are celebrating or remembering their loved ones. Each bag is given a candle and, as it gets darker, those bags become the light that leads our way during night-time hours. We all have different reasons for relaying, but every year during our ceremony, I share one of mine. The first year, I told the story of my mother's best friend, who I had known my whole life. She had taken me on a "date" when I was 5 to see "An American Tale" and then to Chuck E. Cheese's after. She always remembered my birthday with thoughtful cards and gifts and, several years later, it was one of these presents where she had gave me the first novel that I ever truly loved. It was a shock to all of us when we got a message that she had fallen ill while traveling the world, and she passed away a very short time later. When I shared her story during our ceremony, we all looked out at the track and realized together that every luminaria bag represents someone who meant as much to somebody else as she did to me. I'm sad to say that every year since, I've had a new story to tell. But our event is not about sadness, it is about hope, and our relay is in no short supply of it. When I see our progress over the last six years, I am filled with hope for the future. In the time I have been on the committee, we have raised over $200,000 in our community and with the growth of our event, we think we can add another $100,000 this year alone. This event isn't always easy. It's a significant time commitment throughout the year, but the event also gives back to us in ways we don't expect. From friends and family reaching out to offer words of encouragement, to forming unexpected relationships with people in our community, to showing my children what it means to be involved in a cause I believe in, the Tigard/Tualatin Relay for Life always finds new ways to surprise me. I hope you can join us at 10 a.m. July 14 and share the ways Relay can surprise you, too. For more information about how to buy luminaria bags, register for the event as a survivor, sponsor or form a new team, please visit www.relayforlife.org/TigardOR or find us on Facebook. We look forward to seeing you at relay! Nicholas De Salvo is a volunteer for the Tigard/Tualatin Relay for Life.